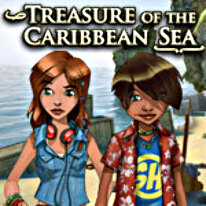 Explore a Caribbean island and search for long lost treasure! Ship's Log, last entry, 1778. Thomas de Grandpré, Captain: "The King has called me to arms. I'm leaving now to assist America in the war of independence from Britain. The ship has been left hidden with everything still aboard her, promising golden days with my wife and son... if I ever get out alive." When Allan and Morgan found this note after moving to the Caribbean, a journey started in the tracks of their ancestor. But careful, rumors say that descendants of the dreadful pirate Matheis still live on the island and that they never stopped looking for this booty. Begin your journey in Treasure of the Caribbean Seas!